Zhao Zhong joined Pacific Environment’s China team one year ago. After a successful career at the helm of Green Camel Bell, a grassroots environmental group based in Gansu Province, Zhao Zhong was eager to help share his skills with other up-and coming grassroots leaders. As Pacific Environment expands to the air pollution and energy sphere in China, we have been gathering ideas from international colleagues and our partners on the ground in China. Here, Zhao Zhong shares lessons learned and perspectives on the potential to fight climate change in China from the bottom-up. PE: You attended two international conferences on coal and climate change earlier this summer. What was the purpose of these conferences? ZZ: The first conference I attended, in May in Australia, brought together a network of international coal activists. The goal was to build a platform for people from different countries and experts to exchange ideas and share interests; for example, I joined the water-energy committee. The second conference I attended, Global Power Shift, was held in Turkey and was open to about 500 youth from all over the world. PE: How were these meetings different? ZZ: If the Australia conference was like college, Global Power Shift was like primary school, with basic trainings on media and direct action, and the goal was for youth, from all over the world, to go back to their home countries and start local projects. PE: What did you learn in Australia? ZZ: I learned successful cases for how NGOs are fighting coal in Australia, Indonesia, and India. The last day, we had a field trip to a community near a coal mine north of Sydney; I realized how local community-based organizations can be involved in coal, and I learned about their motivations and strategies. Visiting the community gave me some ideas about how we can have bottom-up activities on coal in China, where so far there has been little action. PE: What impressed you about the Australia coal community you visited? 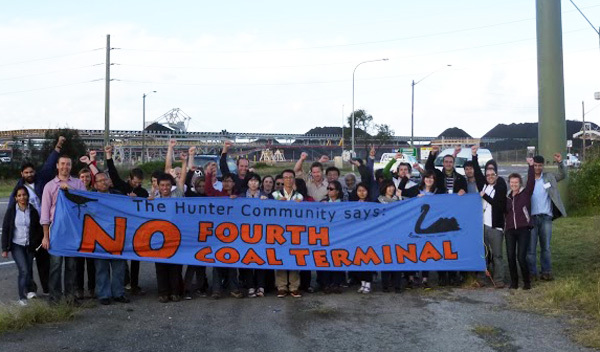 Global coal activists protest exports in Hunter Valley, Australia. ZZ: In Australia, we visited an open pit coal mine. And when the wind blows, coal ash flies into nearby communities, and community members are worried about the impacts on the water and their health. They feel coal should be kept in the ground. They are also trying to build a large port near the mine and we saw a lot of big ships. Organizers at the Hunter Community Environmental Centre had a map showing the potential expansion of coal mines after the port is built. They were very passionate and good at public speaking and making people understand their worries, and could organize local community members to protest and tell the government their feelings against coal power plant. By contrast, activists in China often feel silenced. Also, I was impressed with their office. They had a lot of materials: signs, banners, models and maps…they had a lot of resources to fight their fight and lots of support from both foundations and community members. Chinese groups are often much poorer; they don’t have offices or good materials. They only have the will to try to do something. PE: Do you think coal activism has to be different in China? ZZ: It has to be somewhat different. Similar to other places, we can do field investigations and policy advocacy, we can tell people the impact coal has on their health and the environment, and we can help impacted people protect their rights. But in many places, like Indonesia and India, it’s okay for people to go to the street, and in China, we can’t organize direct action. In Australia, I also learned some new skills that I think we can use in China; for example, finance campaigning may be a way to have leverage by telling investors which are the risky projects and seeking to prevent new investment in coal. PE: What did you learn at the Global Power Shift meeting in Turkey? ZZ: The trainings were more geared toward new activists, but it was important for me to be there because it gave me some ideas for how to encourage youth involvement in the movement. The dozen or so delegates from China had strong English skills and a lot of talent; if they put their energy towards working for NGOs, it will help the movement a lot. PE: Were the trainings useful for the Chinese delegation? ZZ: Some were, but I think the most useful aspect of the meeting was simply the opportunity for these youth to go abroad and be exposed to the larger activist community. It inspires them to stay involved back home. The last day of the meeting we had a march in Istanbul, together with local activists, to protest new coal plants in Turkey. Some of the Chinese delegates didn’t want to attend, but those that did attend thought it was really exciting to be out chanting slogans and carrying signs. PE: What kind of actions will the delegation bring back to China this year? ZZ: Many of the delegates were from the China Youth Climate Action Network (CYCAN), which I have been advising. 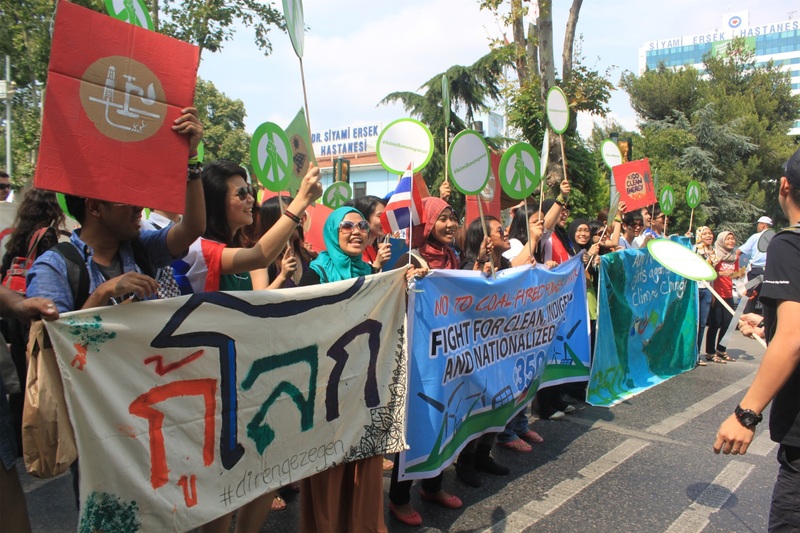 In July, they co-organized a climate change summit for about 160 youth. They had keynote speakers on climate issues, from groups like UNEP and the Ministry of Environment, and there were group discussions and a project design competition. During the design competition, I suggested that groups monitor emissions of power plants, but my team designed a project about electronic waste recycling instead. It seems like the attendees don’t know much about what to do about the climate change problem. Mostly they focus on education to other students and campus emissions. PE: What do you think needs to happen next to charge up a climate change and coal movement in China? ZZ: I noticed that at Global Power Shift, during the breaks, most people talked about energy and climate. But during breaks at the Beijing youth summit, they talked very little about the climate. It seems true that in China, most people are not that interested in climate change compared with other areas especially Africa, Europe, and the US. Yet, I do think things are changing in China; and certainly the younger generation knows more about climate change. Even for those of us who understand, we talk about the problem a lot but we lack ground work on China’s number one cause of climate change, which is coal. We need more practical experience on how to fight against coal and climate change locally. PE: Do you think there is room for activists in China to cooperate with their counterparts abroad on the climate change and coal issues? ZZ: We need to be connected to global campaigns. In Australia, some people were asking me what NGOs in China were doing about coal imports. It was a bit difficult for me to answer. Chinese environmental problems are very serious but we also need to be much more connected to the global movement and pay more attention to global issues. People need to know where pollution comes from in their community, but they also need to know that when they turn on the heat, it increases risks to people who live in Australia and other countries. Their daily life is connected with global environmental issues. PE: What are some of the main things you have learned over the past six months? ZZ: After seeing first-hand the impacts of coal in people’s daily lives in China this past Spring I knew it was a critical issue I wanted to work on. I have learned a lot from activists in other countries and I am clearer now about which models for climate change action will work for China. Being connected with a global activist community, through the meetings I attended this summer, gives me more confidence in this important work.